Yes, wine lovers, its that time again! I almost didn’t remember, but I was home early (well, thats relative – before it got dark, which is a bit of a rare event at the moment!) and the kids were round at their father’s house and I had a moment of mental clarity! It’s been a relatively dry 10 days since I got back -so I decided to open the last of the Killibinbin wines I got from the good food and wine show in Perth over a year ago. I don’t have any wine or beer in the house now (save for the lay down expensive dont drink for at least 5 years wines), so I think this weekend will be spent online looking to remedy that! 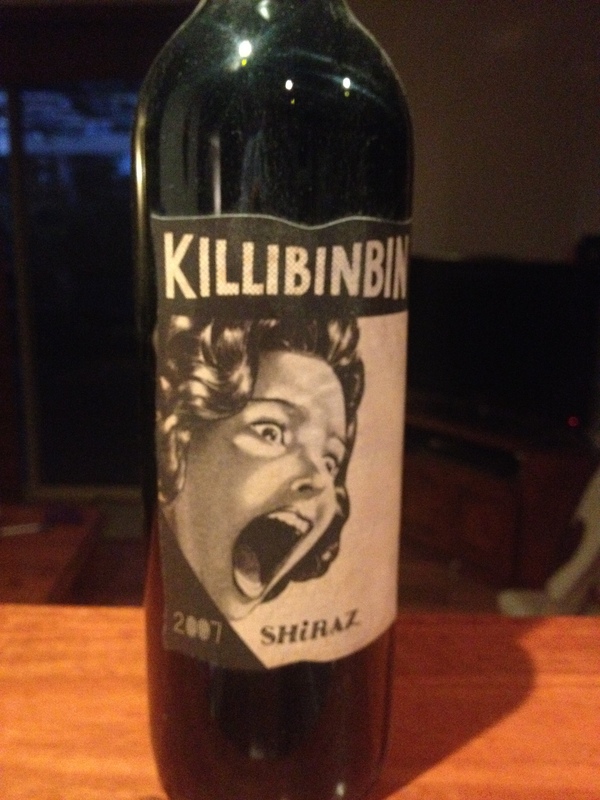 Killibinbin is a brand from Brothers In Arms Wines and really rather splendid wines they are too. Note to self – they are all gone – order more!! So, what can I tell you about this wine – well, its fabulous! Presentation: Similar to the Scaredy Cat – the 1950′s style horror graphics are fab – this one is perhaps the best of the lot with the screaming girl– utterly awesome! full marks. Appearance: dark cherry crimson colour, totally opaque, which is slightly unusual – a lot of Shriazes (Shirii?) have some transparency to them. To some lights, you can the more plum coloured tones that I expect. Aroma/Smell/Bouquet: (lets give it a swirl – glass right in front of me) a pretty intense burst, juicy and quite full on – no messing about! Blackcurrants and plum maybe – certainly dark fruit. I cant smell the peppery spice that the Barossa Shirazes have. Finish: It finishes off with a tannin laden twist – complete with spicy, almost savoury caramelised fruit dryness with more than a hint of peppery spice, but it’s not a fire breathing South Aussie traditional shiraz, its a bit more subtle and layered than that. After 30 seconds, there’s still a jammy afterglow, not sweet but savoury and quite smooth. Verdict: It’s good! I think I prefer the other one to be honest, but this Shiraz is hardly a slowcoach slack-jawed wannabe – its really good – I think it would be a fine partner to some nice traditional butcher style sausages or something like that, especially as the finish is largely savoury. Score: 8.5/10. I really like it – more please!! !